Although the Second World War had ended the previous year, in 1946, shifting Canada’s economy back from wartime production had proven a somewhat lengthier enterprise. Both materials and capital remained in short supply and, in spite of exceptional need, construction had not yet picked up. In spite of this, there were a few bright spots in Ottawa’s construction industry. The new British American Bank Note headquarters. Source: Ottawa Journal, July 22, 1946, p. 9. 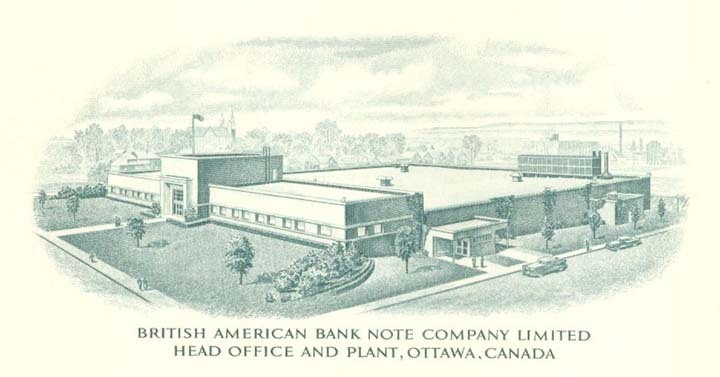 The single largest building permit issued in 1946 was for the British American Bank Note Company’s new Gladstone Avenue headquarters. The $800,000 facility was constructed by the Austin Company and designed to meet the exacting needs of the printer of currency, stamps, and other documents designed to be difficult to replicate.1Ottawa Journal, July 22, 1946, pp. 1, 9, 17. British American was, of course, a well-established company in Ottawa. From its inception in 1866 to 1946, it was located on Wellington at Kent Street. On April 3, 1946, the Bank of Canada completed its purchase of the property and buildings which surrounded it for a total of $1,170,000. As the central bank’s responsibilities expanded considerably through the War, it was in sore need of additional space and it looked to its neighbours, which included British American Banknote, Canadian Banknote, and the old Ottawa Free Press building.2”Bank Pays $1,170,000 For Larger Site,” Ottawa Journal, April 3, 1946, pp. 1, 12. St. Stephen’s Presbyterian was constructed in 1946 at a cost of $150,000. Image: Google Maps, May 2015. 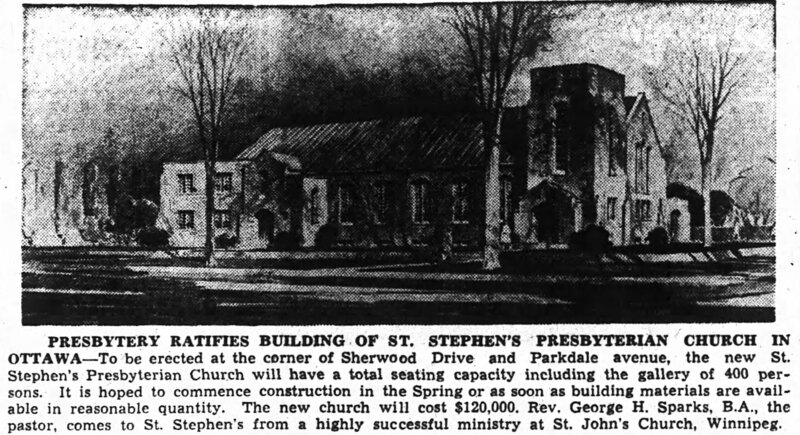 At $150,000, Abra and Balharrie’s St. Stephen’s Presbyterian Church was tied for fourth with Freiman’s significant alterations as the most valuable building permits issued by the City of Ottawa in 1946. 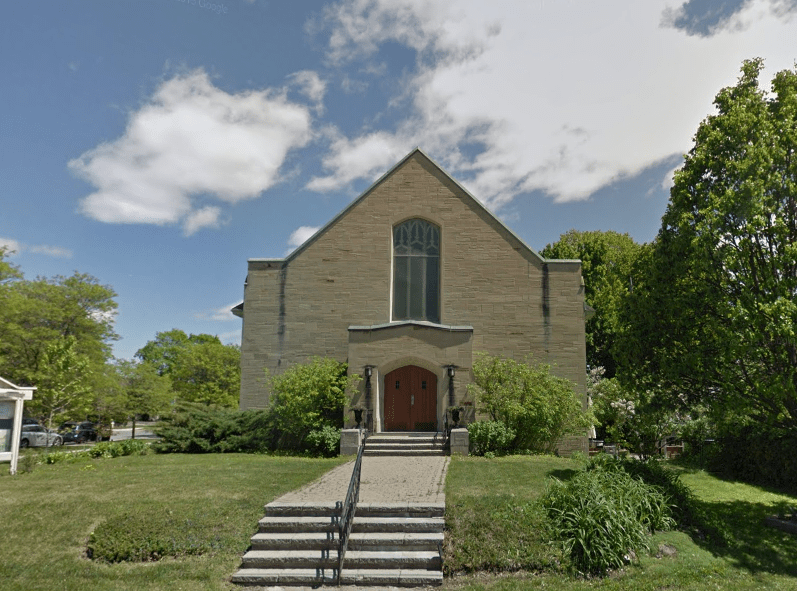 The congregation, which was only formed in 1944, grew quickly and the temporary location of the Gladstone YWCA was woefully insufficient. Wartime material and labour shortages both conspired to ensure that the original vision for the new church was scaled back. Abra & Balharrie’s sketch of St. Stephen’s as run in the local papers. Source: Ottawa Journal, January 22, 1946, p. 7. 1. ↥ Ottawa Journal, July 22, 1946, pp. 1, 9, 17. 2. ↥ ”Bank Pays $1,170,000 For Larger Site,” Ottawa Journal, April 3, 1946, pp. 1, 12.